We hit our Best Bet on the Blue Jackets over Detroit last night and went 3-3 overall. Busy Saturday with 10 games on the schedule, including a pair of afternoon starts. We couldn’t put up a full post in time for the Stars/Flyers game because lines weren’t up for the Islanders/Blue Jackets and Hurricanes/Sharks contests, but we posted our lean on the early game (Stars Team Total Over 2.5) on Twitter. Below are our thoughts on all the games on the docket today, including a Best Bet in the Senators/Kings afternoon affair. Good luck today and have a great weekend. Last month when these teams met in Ottawa, the Kings nursed a 1-0 lead into the final minutes of the third period before the Senators struck for 2 late goals to claim a 2-1 victory. But we expect a much more offensive game in the rematch this afternoon. The Senators have broken out offensively over the past few weeks, scoring 28 goals in their last 9 games. They’re consistently scoring as well, collecting 3+ goals in 3 of their last 5 and 5 of their last 9. Ottawa’s been leaky on the back end also, however, allowing 18 goals in its last 5 games. Eight of those came in 1 game against the Penguins, but it seems the Sens are paying a bit of a price defensively in order to increase their offence. In their last 2 games, they’ve allowed 83 shots. Los Angeles has been playing more wide-open games than usual lately as well. The Kings have allowed 3 goals or more in 4 straight, and they’ve scored 3 or more goals of their own in 6 of their last 9. Without Jonathan Quick in net, LA might be feeling the need to score more goals because they aren’t confident 2 or 3 will be enough. Ottawa’s playing with confidence (5 wins in their last 6 road games) and the Kings should be hungry to get back on track after losing 3 straight home games. It points to a competitive game this afternoon and we definitely like the chances of both teams scoring a couple of goals, with hopefully one of them netting 4 or more to cash this Over. Reasons to bet Dallas: The Stars finally broke out offensively Thursday in a 5-2 win over Nashville. Philadelphia has been outshot in 4 of its last 6 games. Reasons to bet Philadelphia: The Flyers have won 7 straight games , averaging nearly 4 goals per game during that stretch. Dallas has just 4 victories in 15 road games (4-7-4). 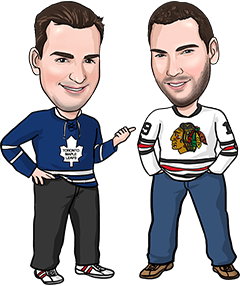 Reasons to bet Toronto: The Leafs have outshot their opponents by a combined margin of 116-73 in their last 3 games, despite losing all 3. The Bruins lost 4-2 at home Thursday to the lowly Avalanche. Reasons to bet Boston: Prior to the loss to Colorado, the Bruins had earned points in 6 straight games (4-0-2). Boston has won 17 of its last 24 home games against the Leafs, who are just 2-6-5 on the road. Reasons to bet Vancouver: The Canucks are 6-3-1 in their last 10 games and upset the Lightning 5-1 Thursday as +200 underdogs. Florida has lost 4 straight, 6 of 7 and 7 of 9. Reasons to bet Florida: Vancouver is 4-8-1 on the road. The Panthers were whipped 5-1 at home by Pittsburgh Thursday and have won 6 of their last 7 games following a home loss of 3 goals or more. Reasons to bet Colorado: In their past 4 road games, the Avalanche has defeated the Wild, Blue Jackets and Bruins while losing by 1 in Nashville. The combined home record of those 4 opponents is 32-17. Reasons to bet Montreal: The Canadiens are 13-1-1 at home and outshot New Jersey 49-21 in a 5-2 win over the Devils. Colorado is 1-7 in its last 8 games following a victory. Reasons to bet Pittsburgh: The Penguins have outscored their opposition 24-11 during their current 4-game winning streak. Tampa’s lost 6 of its last 7 games and scored 8 regulation time goals in its last 6. Reasons to bet Tampa: The Lightning gets its first chance at avenging last year’s 7-game loss to the Penguins in last year’s Eastern Conference final. Pittsburgh has allowed 23 goals in its last 7 games. Reasons to bet New York: The Islanders are 5-0-1 in their last 6 games, defeating the Penguins, Capitals, Rangers and Blues during that surge. New York won all 5 of its games against the Blue Jackets last year. Reasons to bet Columbus: The Blue Jackets have won 9 of their last 11 at home and are 7-1-2 in their last 10 games overall. New York is 2-6-1 on the road. Reasons to bet Nashville: The Predators have dominated the recent meetings between the teams, going 7-1-2 in their last 10 against Arizona. The Coyotes have lost 6 straight. Reasons to bet Arizona: The Coyotes have been a tough team to beat at home recently, downing the Sharks and Oilers while taking the Blue Jackets and Flames to overtime. The Predators are 3-8-2 on the road. Reasons to bet Winnipeg: The Jets are playing well defensively, allowing 2 goals or less in 5 of their last 7 games. Calgary has scored 3 regulation time goals in its last 2 games. Reasons to bet Calgary: The Flames have won 5 straight games and are 7-1-1 in their last 9. Calgary has given up just 14 regulation time goals in its last 9 outings. Reasons to bet Carolina: The Hurricanes are 2-0-1 in their last 3 games and are coming off a 3-1 win Thursday in Los Angeles. San Jose has dropped 2 straight, including a 3-2 decision last night in Anaheim. Reasons to bet San Jose: The Sharks are 9-4 at home and the Hurricanes have just 4 wins in 17 road outings (4-7-6).